In feeding mode – at the startup of MetalX’s 500-hp mega-shredder in Delta, Ohio – a new 1000 Series E-Crane with over 100 feet of reach. According to MetalX, the company invested more than $50 million since 2017 to build their new 60-acre greenfield processing plant in Delta, adjacent to North Star BlueScope's flat-rolled steel mill. The facility is expected to handle more than 500,000 tons yearly and employ over 80 people, with growth plans targeting 700,000 tons per year and more than 125 people. 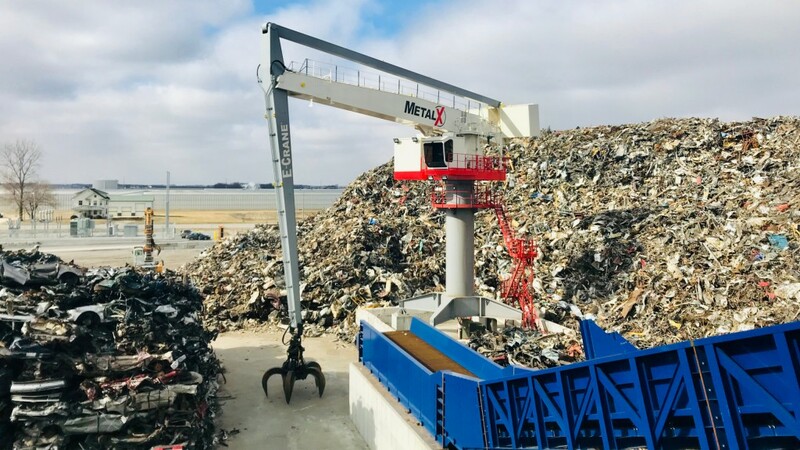 MetalX’s new E-Crane provides over 60,000 cubic metres (80,000 cubic yards) of scrap storage capacity around its base. "Whenever you have a greenfield project, you are always looking for the latest and greatest technology," commented Steven Osborne, CEO of E-Crane USA. "MetalX management was focused on finding the right technology for their new application, and were looking at everything available, from the shredder to downstream." According to Osborne, their equilibrium cranes use about 10 percent of the energy required by diesel-driven cranes - or a about a third of the energy required by traditional electric-driven cranes. The E-Crane 1000 Series Model EC7317 PD-E now in use at MetalX also has a maximum outreach of up to 31.7 metres (104 feet) and a maximum duty cycle capacity of about 10 tons. The machine uses a 200-kW (250-hp) main motor, can stockpile scrap up to 90 feet high, and provides over 60,000 cubic metres (80,000 cubic yards) of scrap storage capacity around its base. "The large outreach and high stockpiling ability of the E-Crane means that enough scrap can be stored within reach of the E-Crane to feed the shredder for over 65 hours," explained Kelly Carl, E-Crane Project Engineer. "The material no longer needs to be handled multiple times before it goes to the shredder, making for an extremely efficient setup." Adam Enders of E-Crane, who was on site for the entire installation of the MetalX unit, added that "Working with the MetalX team on the E-Crane installation went flawlessly. The E-Crane was mechanically erected in just a few days, and then we spent a couple more weeks installing the hydraulics and electrical systems. "MetalX has been nothing less than outstanding to work with, from the initial meetings with engineering and procurement personnel, to onsite management at the Delta facility," said Enders. "E-Crane and MetalX both understood what it takes to push a large greenfield project like this across the finish line, which made the project run as smoothly as possible." Stockpiling scrap to more than 90 feet high in preparation to feed the shredder.